Rifts along the northern shear margin of Pine Island Glacier (upper right of image). Credit: Michael Studinger, NASA’s Operation IceBridge. Apr 19, 2012 • A new study examining nearly 40 years of satellite imagery has revealed that the floating ice shelves of a critical portion of West Antarctica are steadily losing their grip on adjacent bay walls, potentially amplifying an already accelerating loss of ice to the sea. The most extensive record yet of the evolution of the floating ice shelves in the eastern Amundsen Sea Embayment in West Antarctica shows that their margins—where they grip onto rocky bay walls or slower ice masses—are fracturing and retreating inland. As that grip continues to loosen, these already-thinning ice shelves will be even less able to hold back grounded ice upstream, according to glaciologists at The University of Texas at Austin’s Institute for Geophysics (UTIG). Reporting in the Journal of Glaciology, the UTIG team found that the extent of ice shelves in the Amundsen Sea Embayment changed substantially between the beginning of the Landsat satellite record in 1972 and late 2011. These changes were especially rapid during the past decade. 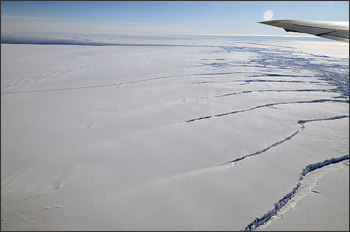 The affected ice shelves include the floating extensions of the rapidly thinning Thwaites and Pine Island Glaciers. “Typically, the leading edge of an ice shelf moves forward steadily over time, retreating episodically when an iceberg calves off, but that is not what happened along the shear margins,” says Joseph MacGregor, research scientist associate and lead author of the study. An iceberg is said to calve when it breaks off and floats out to sea. 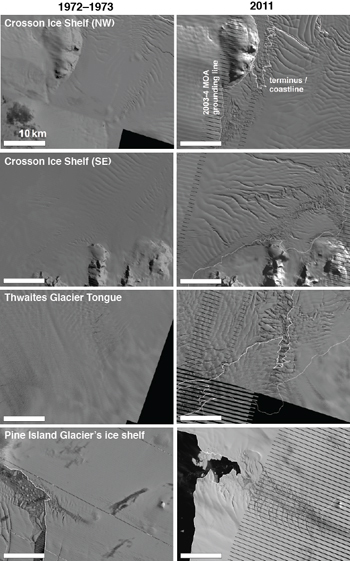 Pairs of Landsat satellite images showing changes in ice shelf margins in the eastern Amundsen Sea Embayment in West Antarctica between 1972 and 2011. The striping visible in the 2011 images is due to a malfunction in the Landsat-7 platform that occurred in 2003. “Anyone can examine this region in Google Earth and see a snapshot of the same satellite data we used, but only through examination of the whole satellite record is it possible to distinguish long-term change from cyclical calving,” says MacGregor. The shear margins that bound these ice shelves laterally are now heavily rifted, resembling a cracked mirror in satellite imagery until the detached icebergs finally drift out to the open sea. The calving front then retreats along these disintegrating margins. The pattern of marginal rifting and retreat is hypothesized to be a symptom, rather than a trigger, of the recent glacier acceleration in this region, but this pattern could generate additional acceleration. The UTIG team found that the largest relative glacier accelerations occurred within and upstream of the increasingly rifted margins. The observed style of slow-but-steady disintegration along ice-shelf margins has been neglected in most computer models of this critical region of West Antarctica, partly because it involves fracture, but also because no comprehensive record of this pattern existed. The authors conclude that several rifts present in the ice shelves suggest that they are poised to shrink further. This research is sponsored in part by the National Science Foundation. The article, titled “Widespread rifting and retreat of ice-shelf margins in the eastern Amundsen Sea Embayment between 1972 and 2011”, appears in issue #209 of Journal of Glaciology. For more information, contact: Marc Airhart, Geology Foundation, Jackson School of Geosciences, 512 471 2241; Joseph Macgregor, Institute for Geophysics, Jackson School of Geosciences, 512-471-0411. This entry is filed under Carbon and Climate, News, Science, Water.